Yet the film feels at least 20 minutes too long, weighed down by those portions in which Hassan takes a job at a fancy restaurant in Paris, where innovation is the key word. That detour aside, the film manages to appeal both to the stomach and the heart, even if the inevitable romance between Papa Kadam and Madame Mallory feels pat. Above all else, the film is a breezy watch because Om Puri and Helen Mirren are simply terrific in it. I’m going with three out of five for ‘The Hundred-Foot Journey’. This is comfort food for those who like their movies all warm and fuzzy. 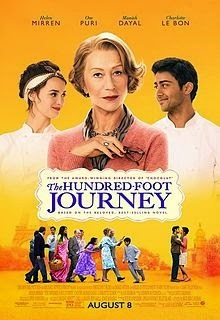 The Hundred-Foot Journey is an interesting dish. Despite its cliches (“You cook to make ghosts”), this is a poignant, pretty film. Its prettiness is a drawback though as shots of sweetly charming French rural life, cobblestoned streets, cheery farmers’ markets, forest-green lanes, et al take over. Sinking pleasurably into its own charms, the movie hesitates to bite deep into stronger flavours – but when it does, it’s a pleasure. The chemistry between ace actors Puri and Mirren crackles like tadka – and when they dance, their loneliness mingles, like caramel, like sugar stirred into tea. The Hundred-Foot Journey is reduced to plot holes and factual inaccuracies of surprisingly epic proportions. The Hundred-Foot Journey has a few ingredients that go into making a cracker of a dish — two acting stalwarts who light up the screen with their mere presence, several gastronomically evocative shots, and beautiful locales.Unfortunately, it’s got the recipe all wrong.